Cooking with steam creates moist, tender food. It's ideal for baked goods and breads as well as healthy fish, chicken and vegetable side dishes. This is by far the healthiest way to cook. Moisture will maintain the foods nutrients instead of baking them out. The food will also have a lower fat content because you’re not using any oil to keep the food moist when baking. Steaming leftovers is a more effective way to reheat to retain natural flavors. The food tastes fresh from the oven due to the moisture (steam), whereas the microwave cooks with high heat and generally dries your food. Basically, the heat of the oven turns the water into steam. The oven has a valve to release pressure of the steam similarly to a pressure cooker or a tea kettle. 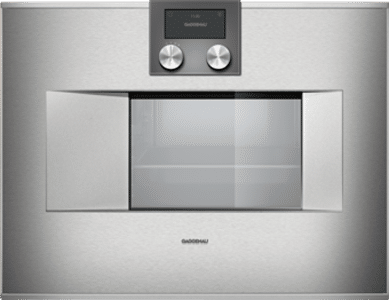 Most steam ovens have a removable reservoir that needs to be refilled, however, the Gaggenau BS 470 is the only oven in the industry that is plumbed. Ironically, Bosch Benchmark and Gaggenau are manufactured by the same company in two Europe and the different factories in Europe and the US. They are designed for different people (if that’s possible in such a limited market). Let’s see what’s best for you. Side Swing door: great for easy loading and access. Available either right or left hinged. Exclusive Cool Steam System: Resulting in no condensation on the door, allowing for better visibility of your food inside. Transfers heat very quickly, which keeps food moist. It is more energy efficient than convection. Individual flavors and aromas are better retained, as well as brighter colored food and food stays its original size. Your kitchen will not smell like what you’re cooking. Exclusive Cool Temperature Sensor: Controls temperature at the center of the food. The oven will switch itself off once the desired temperature is reached. This ensures that no matter what is being cooked, it is always cooked thoroughly, without being over done. Gaggenau seems better for people already versed in steam cooking. It has multiple options, better sensors and is plumbed, so you never have to refill it. It also has the best warranty as well. Its modern styling looks great, but probably does not match most stainless steel appliances. The Bosch is less than half the price and is more user friendly with the touch screen. For someone who has never used steam, it is less intimidating than the Gaggenau. 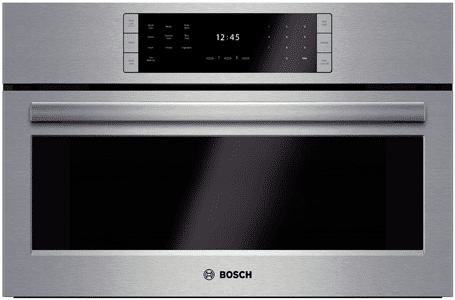 Bosch also matches with other appliances and more specifically their other Benchmark appliances. Download the Yale Speed and Steam Buying Guide with features, specs and inside tips to every major speed and steam oven.  Well over 70,000 people have read a Yale Guide. Amy Ross is an Appliance Sales Consultant at Yale Appliance + Lighting. Amy once competed in the junior Olympics and enjoys spending time with her family .